You may have noticed the term non-exempt or exempt employee displayed on a job application or while reviewing employee regulations. These are terms used by the Fair Labor Standards Act (FLSA) to describe hourly and salaried employees. This article is going to discuss non-exempt employees. To learn about salaried employees check out our article about exempt employees. A non-exempt employee is an employee who is “not exempted” from FSLA requirements. These employees are hourly workers who earn at least the federal minimum wage and must be paid time and a half for overtime hours worked. The FSLA provides these regulations to protect employees who are working in the private sector. What does the FSLA provide? The FSLA provides coverage for roughly 135 million employees in the United States. It establishes federal minimum wage, overtime pay requirements, record keeping guidelines and youth employment standards. The FSLA's primary goal is to ensure an employee is being paid fairly by their employers for their time and effort. In 1938 the federal government established the Fair Labor Standards Act (FLSA). The new Act required employers pay employees no less than the minimum wage; minimum wage was 25 cents per hour in 1938, thats worth $4.19 in today's money. It also requires employers to pay overtime for any hours worked over 40 hours per workweek. 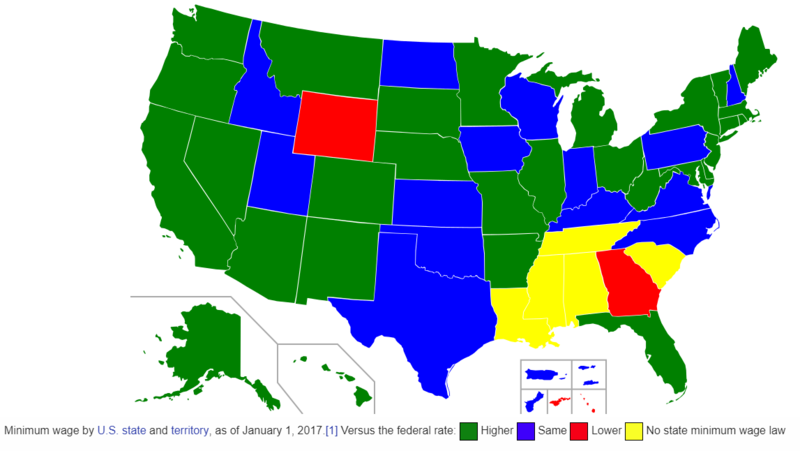 The federal minimum wage applies to all states in the union. However many states have elected to choose alternative higher minimum wages to fit their local needs; for example, Massachusetts and Washington have the highest minimum wage at $11.00 per hour. 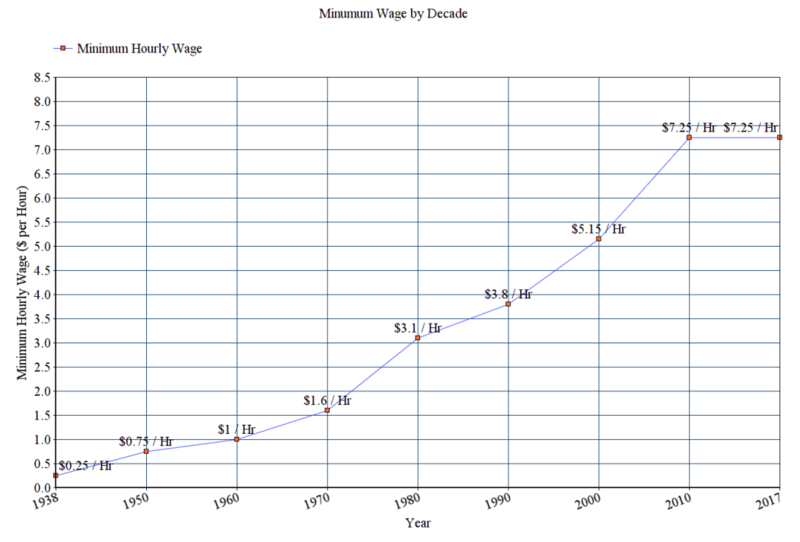 The steady increase in the minimum wage since it was mandated in 1938. A non-exempt employee must receive overtime pay for hours worked over 40 hours per week (7 consecutive days). Averaging the hours over two or more weeks is not permitted. The overtime rate must be at least one and a half (1.5x) times the employee’s regular hourly wage. Also, the FSLA does not require overtime pay on specific days such as Saturday, Sunday or Holidays and there is no cap on the number of hours an employee can work during a 7-day cycle. If you are not sure about overtime rules for your state, check out our web-page that explains state level overtime rules. The FLSA requires employers to retain employee personal information, agreements, sales and wages for at least three years after employment. Timecards must be kept for at least two years. Below is a complete list provided by the department of labor website. Time and day of week when employee's workweek begins. In a nutshell, hours worked is anytime during regular business hours when an employee is considered to be on the clock. Except for longer breaks such as lunch, all other time is considered paid time. For a complete list of definitions for hours worked, please check out this fact sheet from the department of labor. Any hours during regular business hours. You may have noticed a minimum wage poster pinned to the wall at work. Federal law states that this poster must be visible for employees to see. The wage and hour division website does an excellent job at helping employees better understand their rights and how to file a complaint if an employer is believed to be in error. We hope this article provides a better understanding of what a non-exempt employee is and the things you need to consider to remain compliant. Remember, each state may have its specific minimum wage and specific overtime rules. OnTheClock is trusted by over 6000 employers. Our software handles all overtime calculations for non-exempt employees and will keep your business compliant with federal and state laws.